The smart scooter is aimed at those with mobility limitations. 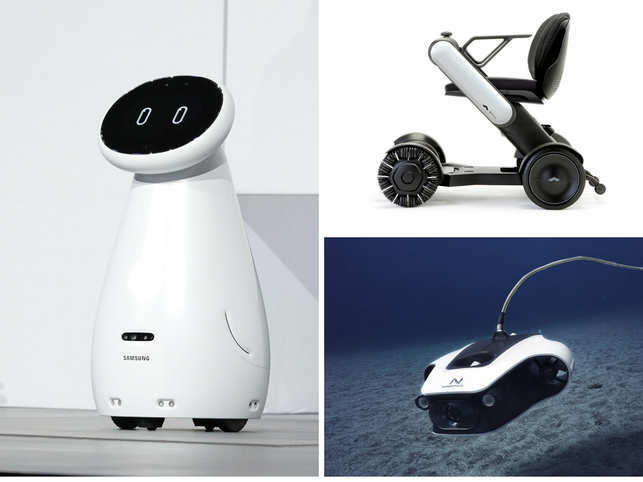 On the left is Samsung's Bot Care, top right is the smart scooter Model Ci and on bottom right is the underwater drone. Stunning TVs, auto tech, home robots and tiny gadgets dominate the floor of the ongoing Consumer Electronics Show at Las Vegas. Daimler AG will start selling a truck this year that’s able to brake, accelerate and steer at all speeds on its own. The updated combustion-engine-powered Freightliner Cascadia will also have lane-keeping assistance and fuse information from radar and cameras to enable partially autonomous technology (level 2). As vehicles get smarter, your car will be keeping an eye on you. Silicon Valley company Eyeris has unveiled a car dashboard monitor which uses cameras and AI to track drivers and passengers for safety. Data from the cameras is analysed with image recognition software to determine whether a driver is looking at his phone or the dashboard, or getting sleepy, etc. Taking a cue from the latest Apple Watch, Garmin announced its first 4G LTE-enabled GPS smartwatch. So, the new Vivoactiv 3 Music watch will now allow you to leave your smartphone behind and do the basic work through the wearable. Chipmaker Intel showcased its latest 10nm-based network system on chip (SoC), code-named ‘Snow Ridge’ aimed at upcoming 5G. The network SoC is intended to bring Intel architecture into wireless access base stations and allow more computing functions to be distributed out at the edge of the network. Samsung previewed a 75-inch version of its new modular Micro LED TV that can be customised to any size and shape. It can optimise the content irrespective of the shape of the screen. The company expects that the innovation will allow users to set up displays that suit their spatial, aesthetic and functional needs. Mobility firm Whill was spotted offering test drives on its autonomous mobility scooter Model Ci around its booth at CES. Aimed at those with mobility limitations, it can be driven and locked/unlocked remotely using its accompanying app. It also includes voice notification alerts, electromagnetic brakes and anti-sway feature. EyeQue Corp’s VisionCheck refractometer enables anyone to test and track their eyesight. The company says it is the first automated at-home refractometer that can measure nearsightedness, farsightedness and astigmatism using an optical smartphone attachment, mobile app and cloudbased processing. Navatics Technology displayed its underwater drone Mito that can capture photos and videos. It comes equipped with a 4K camera and advanced stabilisation. Samsung introduced Bot Care robots that help people manage their daily health routines. It can measure blood pressure and heart rate, detect falls and administer medicine. The Bot Retail is designed to communicate with consumers in stores, while the Bot Air robot detects indoor air quality and purifies it. A 4K TV that rolls up is going to be very expensive and of course look good in your living room. A TV that is there when you want it and disappears when you don’t. 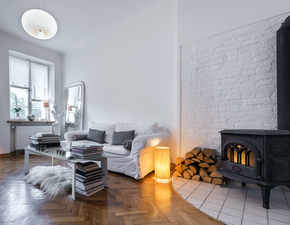 This is the kind of product that blends-in with the aesthetics of your home. It drops slowly and steadily into the base and, with the push of a button, rises back up in about 10 seconds. This offering from Samsung aims to make the experience of people working in offices better, and add value. It is easy to set up and adjust, and when you are not using it, it is simple to push back and store it flat against the wall. It has a unique built-in space saving solution, a minimalist fully integrated arm. You can clamp it to the desk and free up desk space. Beer drinkers, rejoice! Finally, a tech company has solved a really important problem. Imagine brewing your very own beer in the cofort of your home. The gadget brews craft beer by utilising single-use capsules, which have the ingredients needed for the perfect pint. Each capsule contains malt, yeast, hop oil and flavouring. The machine ferments, carbonates, ages and serves beer automatically. You can make up to five litres of beer in one go. The Vive Pro Eye's endeavour is to bring better and improved quality of VR experiences. This is possible through a technique called 'foveated rendering'. The price for this has not been decided yet, but it is most likely to be launched in the second quarter of 2019. You may be able to quickly open menus, search on the internet, and much more by just focusing your line of sight.